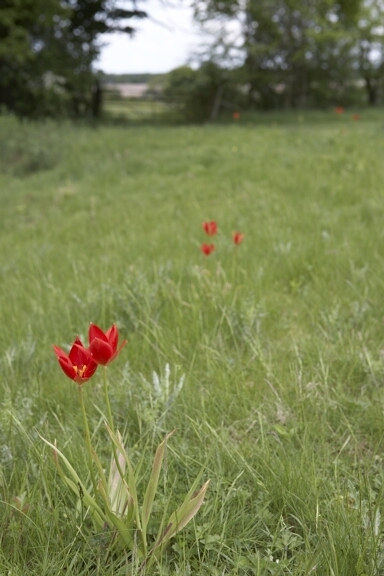 There are few more heart-stoping sights than seeing a spring meadow dotted with the bright scarlet flowers of Tulip sprengeri. In the wild they grow in the Pontic mountains, a range in northern Turkey that sweeps down to the Black Sea. In gardens they are extremely versatile: I have seen them growing in sunny spots on the great rock garden at Kew and in scree garden in the west of Scotland. The most impressive plantings, though, were in the rough grass of an old orchard. In heavy soil and dappled shade, conditions disliked by most tulips, they were happily established and had been seeding themselves around for years. The plant grows to about 40cm (16in) tall and the bulbs should be planted about 12cm (5in) deep. If you want to speed up their spread, collect the seed and sow it in trays. planting the small bulbs out in their second year will give them a much greater chance of reaching maturity than by just spreading the seed around. The bulb will usually flower five years after sowing the seed. The Plant arrived relatively recently into cultivation when bulbs were set from Turkey to the Damman nursery near Naples, Italy. Carl Sprenger, who worked at the nursery had the honour of having the tulip named after him. There is also in his honour a Magnolia sprengeri. I hope that someone, somewhere has planted swathes of the tulip under the magnolia.